An 12-year excavation project concluded last week, uncovering the mysteries of Iran's "Burnt City." Of particular interest to the Dental Ninja is the discovery of rampant PARAFUNCTION among inhabitants of the Burnt City. For you anti-dentites, "function" refers to the use of teeth for the purposes for which teeth were intended (i.e. chewing, speaking, smiling, and let's not forget scaring your enemies). "Parafunction" refers to the use of teeth for anything else, such as biting through fishing line or fingernails, opening a package, or holding your wife while flying high above the ground swinging from a trapeze. Anthropologists discovered various wear patterns in the dentition of the Burnt City inhabitants which lead them to conclude that the mouth was regarded as a "fifth hand." The Tehran Times explains that teeth were helpful for "weaving wicker, nets and textiles, and in creating artwork with ornamental stones." What the article won't tell you, however, is something the archeologists don't know: the cause of the Burnt City's downfall. Let us consider a society where all the artists and textile workers spend their lives using their teeth as hands. My theory is that competition drove them to work harder and harder, eventually wearing grooves and holes all through the enamel into the dentin and approximating the pulp, causing EXTREME sensitivity. Eventually there was a breaking point, and half of the city went INSANE from the DENTAL PAIN. (Wow, that sounds like a song title - watch for it on my next album). From this point on, the city imploded on itself. All order was lost and chaos prevailed. My friends, this was indeed a grim demise. Had the ancient inhabitants left us a record, I'm convinced they would have warned us of the dangers of parafunction. 4 out of 5 dentists may recommend chewing gum to reduce cavities, but one Mexican director for conservation of public spaces recommends swallowing that gum when you're done. On the other hand, one pediatrician warns that doing so could cause an intestinal blockage. What do I do?!? 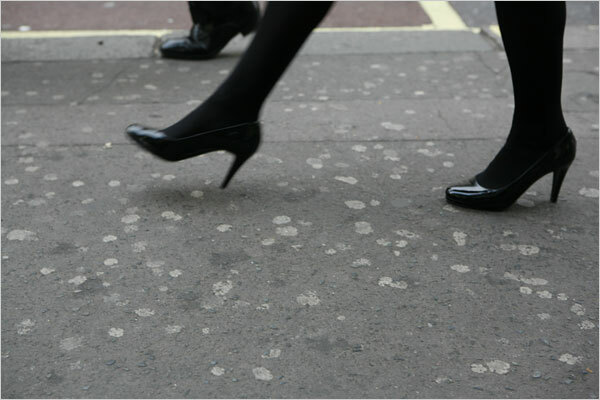 The controversy centers around a sticky statistic: in Mexico City, the city-wide average for number of discarded gum blobs per square yard of sidewalk is 70. This article from Yahoo News, which is a pretty interesting read, outlines the problem and a few possible solutions, ranging from expensive sidewalk steam cleaners to organic gum that supposedly breaks down much more quickly than regular gum. The large-scale city clean-up is set to begin next week. The Dental Ninja's solution? Just throw your gum in the garbage like a normal person. If you happen to watch NBC's "The Last Templar" premiering next Sunday, here's something to watch for: a very painful passionate kiss. That's because actress Mira Sorvino suffered a dental injury during filming in Morocco. She reportedly broke 5 teeth! Details are sketchy, but this article states that "a big wave crashed over her during a boat scene, and it washed out her contacts. Then, she says a hook got caught, and it slammed into her face, breaking five of her teeth." In true "the show must go on" fashion, production continued with a passionate kissing scene. Ouch. This story happened last October in Croatia, where Stipe and Mirna Cavlovic were caught up in the middle of a disagreement between two men involving money. (The article, found here, doesn't really go into detail on how or why the couple were involved, or what caliber of weapon was used). I thought I was dead for sure. I didn't even see the bullet hit my wife. I just saw the flash of the gun's barrel. The next thing I knew was something hit my false tooth and I spat out the hot lead. It hurt like hell but we're both still alive. Ballistic experts attribute Stipe's survival to the bullet having lost so much speed by grazing Mirna's cheekbone. The would-be killer fled the scene but was later arrested. He was seen by the cameras. He is clearly out of shape. Had he been a true ninja, the headlines would have read, "Two ATM's mysteriously disappear overnight - Police have no leads"
Had there been audio of the security footage, I'm convinced we would have heard phrases like "yarr!" and "aye, surrender the booty ye metal devil clobberhead!" For the Love of Teeth! Every once in a while I come across a story too bizarre to not share. This is one of them. Hannibal Helmerto is a man who left his normal life as a German tax inspector to join the circus as a sword swallower (really). He surgically modified his tongue so he looks like a snake, which, I might point out, is a great career move for anyone. Somewhere along the way he met and married a lovely lady and they settled down in London. Unfortunately, Hannibal and his wife recently started having marital troubles and got divorced. In preparation for the divorce settlement, Hannibal took some extreme measures to keep his most prized possession - a 40,000 year old piece of mammoth ivory. He removed two of his own teeth and implanted the ivory in their place. Hannibal Claims: "I could bear to lose everything but my ivory. She can't take my body away from me and nobody can pull my teeth out. It's part of me now and there's nothing she can do about it." This article, which can be found in its entirety here, leaves me with a few questions. #1 - Did he do the procedure himself of did a dentist do it? This is really lose-lose. If he did it, he had no idea what he was doing and it will soon fall out anyway. If a dentist did it - I'd have to question the ethics of that dentist. The only way I would ever perform a similar procedure is if the patient's teeth were diseased and he needed dental implants anyway, but even then I would have to do some research on the procedure and the likely outcome. (40,000 year old mammoth implants isn't something they cover in dental school). #2 - Would that plan even work? I'm not sure how much credit to give this guy. On the one hand, he's German (+1 smart point) and worked as a tax inspector (+1 smart point). On the other hand, he joined the circus (-1 smart point), he forked his tongue (-1 smart point) and he implanted his FREAKING mammoth ivory in his mouth!!! (-5 smart points). I recently spoke with a judge here in the states, to whom I happen to be related, to get his take on the case. Although he was unfamiliar with British law, if he were presiding over a similar settlement in his state, the value of the ivory would count against the assets that Hannibal took from the marriage - so yes, he could keep it, but it's not like he's really coming out ahead when everything is divided up. I'll try to keep you posted with any follow up stories on this case. Elephants enjoy a nice "Christmas Treet"
Nature is full of examples of thinking "win-win" with mutualistic symbiotic relationships, such as that of the rhinoceros and the tickbird (also known as an oxpecker, hehehe) or the realtionship between sea anenomes and clown fish. 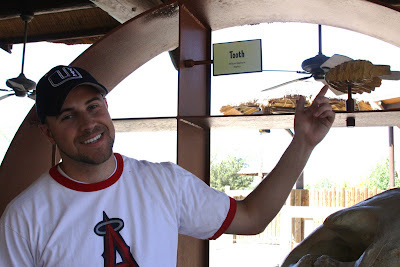 Some of these relationships involve teeth - think of the crocodile and the little bird known as a "plover." This week I discovered yet another one of natures beautiful mutualistic symbiotic relationships: the Elephant and the post-holiday German family. German zookeepers have a program that helps families dispose of their Christmas trees and at the same time gives the local elephants a special holiday treat. According to the zookeepers, the pine trees are not only a delicacy, but they help clean the elephants' teeth. Each elephant eats up to three Christmas trees per day. A few photos and descriptions can be found at the China Daily. 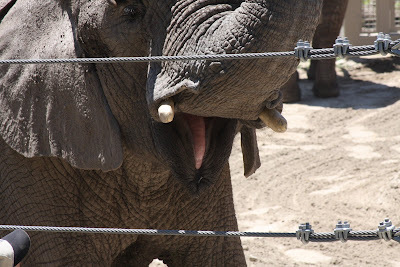 Pop quiz: How many sets of teeth does an elephant have during its lifetime? The answer can be found after this picture I took during my trip to the zoo last summer. Next time an endo procedure isn't going so well, just remind yourself it could be worse.